The first thing I do is stroll to the end of the pier and look back across the little harbour and its pebble beach. My husband stands outside the pub, bright in his yellow jacket. Earlier, he struggled to get down the impossibly-steep main street, pushing his bike and hobbling painfully over the cobbles in his cycling shoes. I tried to warn him it would be really tough, but I couldn’t contact him because there is no mobile signal down here. He has decided use the ‘secret’ service road at the back of the pub. It is too steep to cycle and he ends up pushing his bike for much of the way. But at least he is on flat tarmac. The harbour wall is still in sunlight. People are enjoying the last rays before the shadow from the cliff overtakes them. 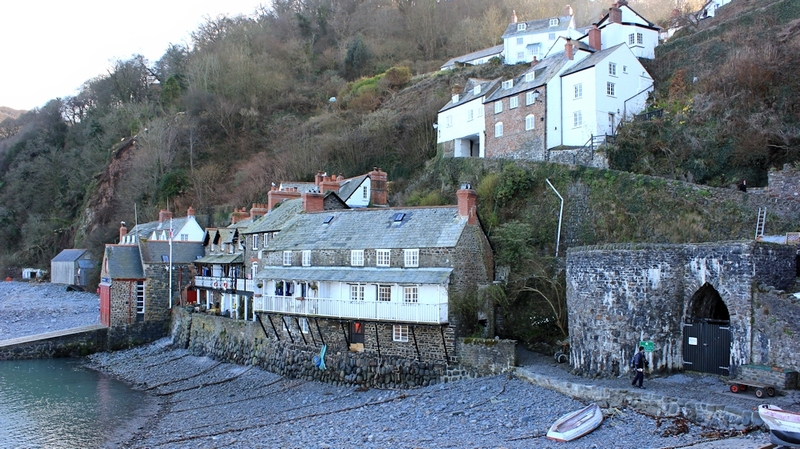 Clovelly is an impossible village. Ridiculously steep slopes. Inaccessible. Beautiful. The only safe harbour between Boscastle and the waters of the Bideford/Barnstable estuary. Before I leave the harbour, I take one last photo of the sunlit quay and the cliffs beyond. Once this was a thriving fishing port. It is sad to see only a single lonely ship in the water. I go off down a side street, choosing a way that doesn’t seem as steep as straight back up. This little alley is very picturesque, passing under parts of buildings. But I needn’t have bothered trying to find an ‘easy’ way. Every side street leads back to the main street. Some of the difficulties of living here become apparent. It is very quaint, but the simplest task, such as gardening, has to be done while perched on steep slopes and hard cobbles. There are no cars, of course. How do people carry their shopping to their front doors? How do shops and cafés replenish their stocks? How does the gardening lady transport her bedding plants and compost sacks? The answer seems to be, “by sledge, of course”. Yes. Leaning against walls are strange-looking contraptions, set on wooden runners. They are often tied to railings. Whether this is to deter casual theft or to prevent them sliding away down the street, isn’t clear. The sledges seem a practical solution. Before sledges there were donkeys. Outside the tourist season the place is deserted and the cafés are shut. I wonder how many people really live here. 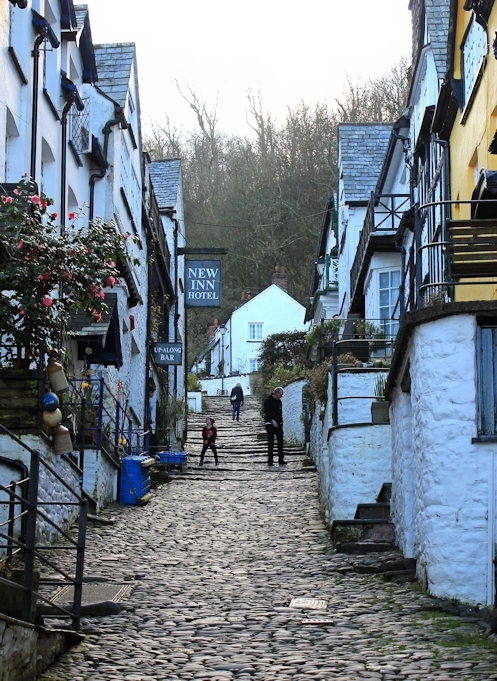 Later I discover the whole village is owned by the Clovelly estate and, if I had come in through the designated main entrance, by the car park at the top of the hill, I would have been charged an entrance fee. At the top of the main street I stop and take one last photo down the hill. From here the path climbs further up, until it joins a road just below the official car park. To my left I see the gated entrance to Hobby Drive, where I will resume my walk tomorrow. 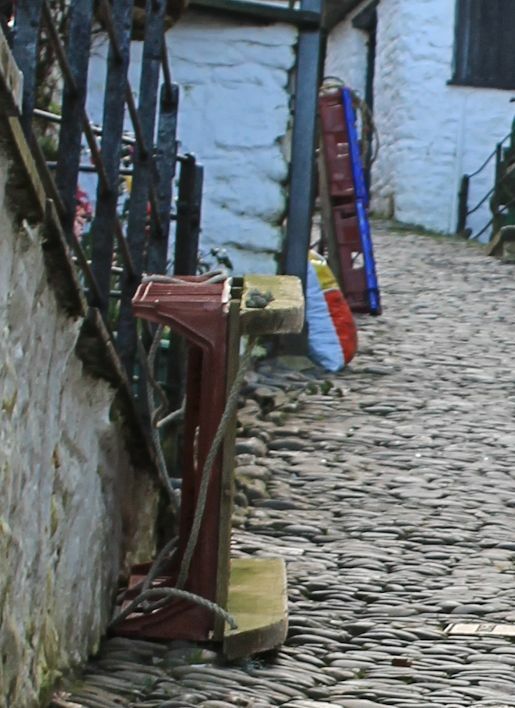 But this evening I am making my way back to a B&B in Higher Clovelly and I know there is a footpath that will take me up via the village of Wrinkleberry. This must be it. Wrinkleberry Lane. It is unusual to see a footpath marked with a street sign, and I hesitate. Have I made a mistake? Is this a proper road? No. It would be impossible to get a car along here, and there are even steps in places. It must be a public bridleway. I meet nobody on the walk up Wrinkleberry Lane. The deep banks and the variety of trees suggest this is an established and ancient route. I feel a thrill of excitement, knowing that I am walking along a roadway that has probably existed for hundreds of years. A sunken lane. 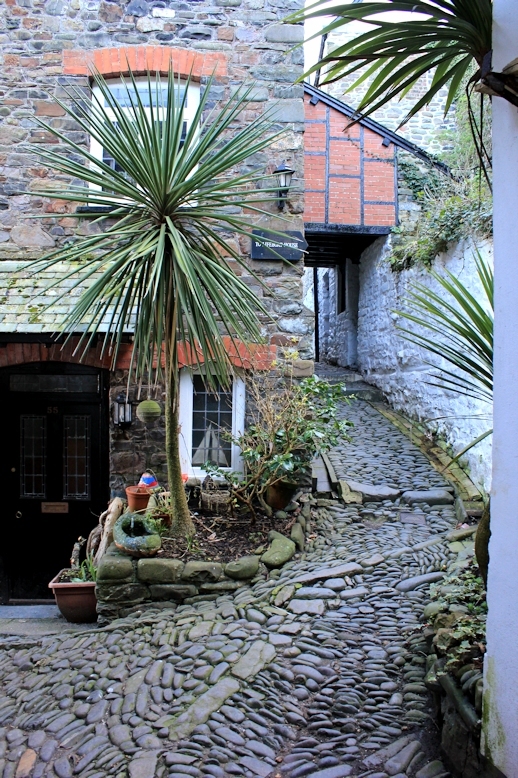 I can imagine generations of donkeys, horses, carts, and walkers, using this as the main route down to Clovelly. When I get back to my farmhouse B&B, I meet a crowd of my least-favourite animal. Cows. But this lot are safely penned up for the night. They stare at me as I walk across the yard. I make the most of the situation and decide to demonstrate my human superiority by giving them a full-frontal predator gaze. They look unimpressed. In the safety of the front porch, I take off my walking boots. Until tomorrow. This entry was posted in 09 Devon and tagged coast, hiking, photography, travel, walking. Bookmark the permalink. What memories you’ve brought back. It really is a charming little place although those cobbles are tough on the feet I remember. I’m sure there were more boats in the harbour back then too. It is gorgeous. Tough to live there, I imagine. Saw a lady walking down the hill with her arms full of dry washing. Tiny allotments carved into the upper slopes. People find ways to live on a cliff! 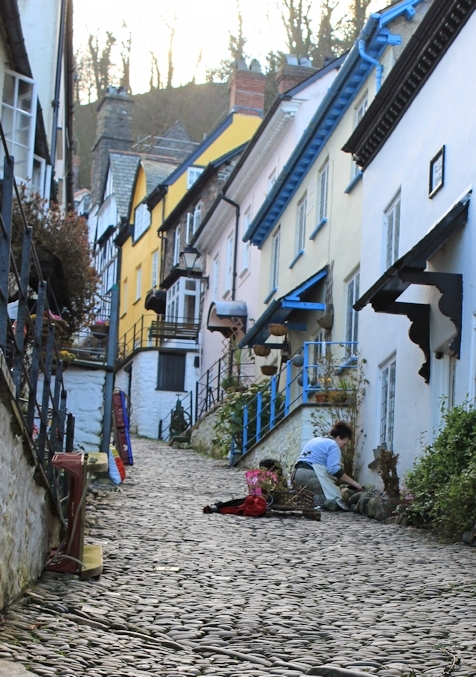 Clovelly reminds me a bit of Gold Hill in Shaftesbury, with the steep hill and the cobbles! Picturesque but not practical. It did seem a bit like a museum set.